The Raritan P2CIM-APS2 is a Paragon II Computer Interface Module (CIM) for PS/2 providing automatic skew compensation with P2-EUST. (Limited stock) only will stocks last. Computer Interface Modules (P2CIM-APS2): Provide all original P2CIM features PLUS automatic skew compensation when used with P2-EUST. All Raritan CIMS Provide "keep-alive" keyboard/mouse emulation at the server. Just plug the CIM into the server's keyboard, monitor and mouse ports and connect it to Paragon II with a single Cat5 cable..
All Raritan CIMS Provide "keep-alive" keyboard/mouse emulation at the server. 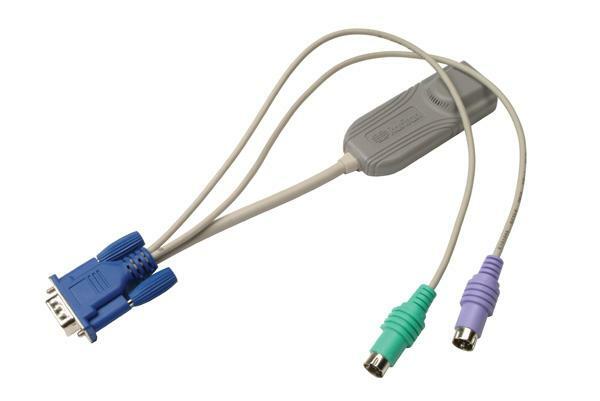 Just plug the CIM into the server's keyboard, monitor and mouse ports and connect it to Paragon II with a single Cat5 cable. Provide all original P2CIM features PLUS automatic skew compensation when used with P2-EUST. Users can manually adjust the video clarity per server. Skew settings can be saved for use the next time the user logs onto the system. NEW Computer Interface Modules (P2CIM-APS2): Provide all P2CIM features PLUS automatic skew compensation when used with P2-EUST.